The return of sunspots! Maybe! A quick comparison to the Sun’s disk (done with Photoshop, so don’t quote me extensively!) indicates this group of spots is about 10 times the width of the Earth, making it decently hefty. It’s the biggest group we’ve seen since the solar minimum a couple of years ago. The Sun’s face has been almost entirely devoid of spots for some time, and it’s been getting a little weird. There was some activity earlier this year, but it didn’t seem to be gaining any footing. 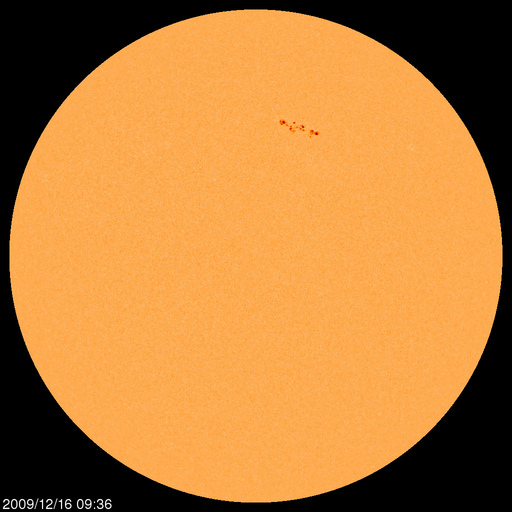 And while this new group of spots doesn’t mean the new solar cycle has finally gotten started, it’s a good sign. As a quick refresher: the Sun is a variable star. Its magnetic activity strengthens and weakens over a roughly 22 year cycle. It’s actually two 11 year cycles: the field rises in strength over 5 or so years, peaks, then dips back down over the next 5 or so years. When it begins to rise again, the polarity (north/south) is reversed. To be clear, it’s not the actual spin of the Sun that flips, just the magnetic field poles. Also, it’s not exactly 5.5 years every time; the length of the cycle itself can change a bit. When the Sun’s magnetic field is at its strongest, we see lots of sunspots, which are areas on the surface of the Sun where the local magnetic field lines constrain the movement of the Sun’s gas. The gas cools and dims, looking dark against the hotter gas. Normally, convection (like boiling water) would drag the cooler material down into the Sun’s interior, but the magnetic field prevents that, so sunspots can persist for days or weeks. Mind you, it’s all far more complicated than this, but hopefully this gives you the idea. Right now we’re at the minimum of the Sun’s magnetic cycle, and normally we would have seen a rise in magnetic activity more than year ago. But for some unknown reason the Sun has been slow to return to its usual business. No one is really sure what would happen if the minimum were prolonged for years, though there is a weak tie between sunspot activity and the Earth’s temperature (and no, not enough to account for global climate change). In the face of all these unknowns, I’ll be honest and say I’d like to see the Sun getting back on the stick and producing spots again! So this new grouping is a tentative relief. Hopefully we’ll be seeing more spots soon. Also, I’ll note that this grouping comes just a few days after a nice filament erupted from the Sun, as seen here by the STEREO spacecraft. You can monitor the Sun in real time by going to the SOHO spacecraft website, where they frequently update pictures from the solar observatory.